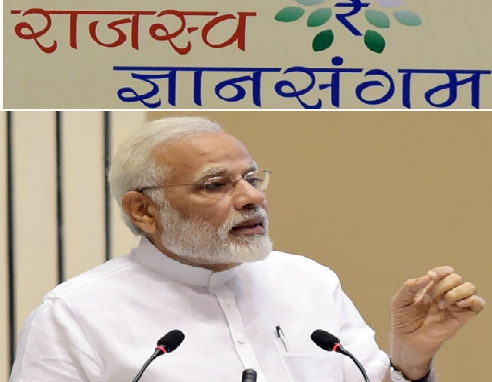 The Prime Minister, Shri Narendra Modi, today inaugurated the Rajasva Gyan Sangam at New Delhi, and addressed the tax administrators of both the Union and State Governments. The Prime Minister exhorted the officers to improve their work-culture, to incorporate both a "sense of urgency", and "measurability", in their performance. The Prime Minister asked the officers to fix clear targets to improve the country's tax administration by 2022, the 75th anniversary of independence. He said that the Union Government is working towards creation of an environment which shatters the confidence of the corrupt, and instills confidence and trust among the honest taxpayer. In this regard, he mentioned steps taken by the Union Government, such as demonetization, and implementation of stringent laws against black money and benami property.